This work is by Andy Cooperman, juror for "Refined IX: Humor," an exhibition of metalworking and jewelry which opens with a gallery talk at 5:30 p.m. Friday, Jan. 29, in The Cole Art Center @ The Old Opera House. A reception will follow. NACOGDOCHES, Texas - The Stephen F. Austin State University College of Fine Arts and School of Art will host "Refined IX: Humor" exhibition Jan. 29 through March 12 in the Reavley Gallery of The Cole Art Center @ The Old Opera House in downtown Nacogdoches. 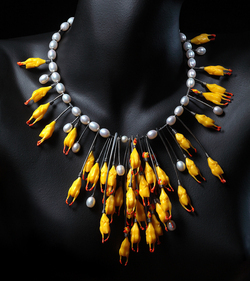 "Refined" is a biennial exhibition of jewelry and metalwork hosted by the art metals program in the School of Art at SFA, according to John Handley, director of art galleries at SFA. Cash prizes totaling $1,500 are awarded at the juror's discretion. This year's theme in humor is "A Bracelet, a Brooch, and a Teapot Walk into a Bar." "'Refined' challenges artists to display their authentic talent, free from the concern of modifying the work to satisfy one theme," Handley said, adding the exhibition is focused on the diverse field of metalworking and jewelry. "Whether you work in metal, stones, plastic, fiber or found materials, if you are a 'smith,' it carries into whatever work you create," Handley said. All work must be original and completed within the last two years. Submitted works are open to a full range of processes and materials. This year's juror is Andy Cooperman, a studio metalsmith, educator and advocate in the metalworking and jewelry field. He received his degree in studio art from State University College of Oneonta and has continued to make art and educate throughout his career, giving lectures and demonstrations at more than 25 universities and multiple art centers, and has presented at several professional conferences. Cooperman has committed years of service with the Society of North American Goldsmiths and is a planning committee member for the Annual Northwest Jewelry and Metals Symposium. He has authored multiple articles, and his work has been included in numerous publications, including "Humor in Craft" and "The Penland Book of Jewelry." Cooperman continues to exhibit work throughout the United States and abroad including recent solo exhibitions at the National Ornamental Metals Museum and the Appalachian Center for Craft. He has work included in multiple permanent collections including the Victoria and Albert Museum and the Tacoma Art Museum. The show, sponsored in part by the Nacogdoches Junior Forum and SFA Friends of the Visual Arts, will open with a gallery talk with the artist at 5:30 p.m. Friday, Jan. 29, with a reception to follow. Winners will be announced at the reception. Admission is free.